Feeling so cheery after our day at the opera yesterday! The dress rehearsal of Armida at the Metropolitan Opera in Lincoln Center was fabulous! ...I was surprised at how much I enjoyed it! Anyway, Jackie asked me if she could use the photo in some personal artwork of hers. I thanked her for asking permission and told her that of course she was welcome to use it. Then she asked me what my favorite book was as a child. I immediately thought of the first book of my very own.... that I received when I was 7 from my Aunt Alice at Christmas. The book was called, Flash of Washington Square. I remember reading it from cover to cover...over and over and looking at all the pictures....I really loved the story and still have the book today. I love to make collage boxes and when I saw your picture I was inspired. I had images in my mind of what the little girl in the photo would be dreaming about. I knew it would be something special as she fell asleep exhausted from her busy life and surrounded by toys and books. Thanks so much for letting me use it. Letting her use it? What a wonderful gift....how sweet is she? Thank you Jackie for being inspired...for your wonderful, creative and generous spirit! 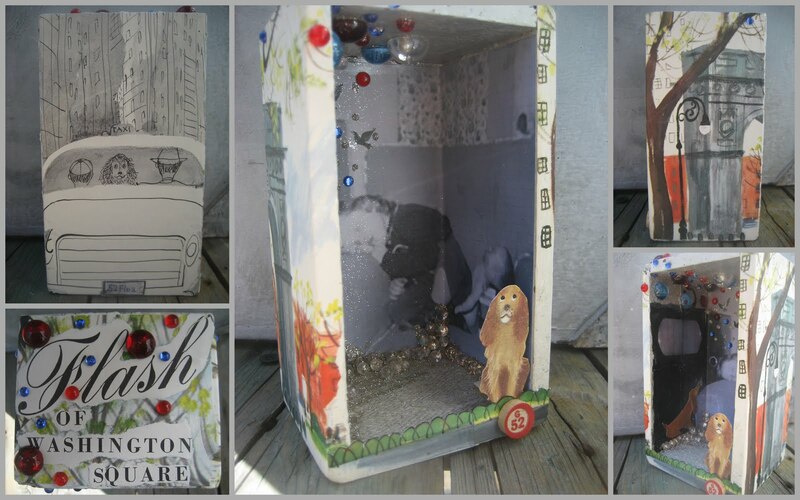 I love this little box collage and I love the fact that you thought enough of me to create this gift! Aren't blogging friends the best? How sweet! First of all your trip and opera, then to find that adorable collage of YOU in the mail. Oh how cool! I love the sweet little girls in their outfits! Cute models!! Have a super great extra special wonderful weekend! What a wonderful gift !! and yes blogging friends are the best !! And ho sweet that little girls ....and i am glad you like the opera....have a nice flea market sunday my dear !! What a lovely gift, your friend gave you. I, too, am new to opera. My first was "La Boheme", at the Sidney Opera House in Sidney Australia two years ago. I was overwhelmed and over-joyed at the same time. I loved all of it. I, too, love opera. The first time I went; it was to see "La Boheme". It was playing at the Sidney Opera House in Sidney, Australia. I was both overwhelmed and overjoyed. Thanks for the pics, I forgot to take pics before I sent the box off. 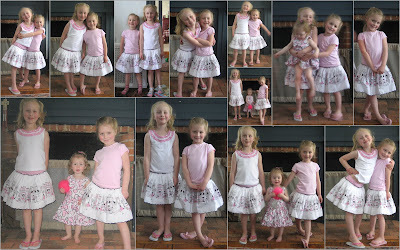 The little girls are adorable...Happy flea-ing! Sounds like you had a wonderful time. What a sweet gift you received. How precious, you sweet little girls are so adorable...love the crossed ankles. And your gift-so special indeed. Thanks for taking me to the opera through your eyes, my first time too. It is a precious photo! And how very thoughtful for Jackie to do this just for you! Thanks for sharing this with all of us. Looking for some inspiration for decorating a shop im opening- and found your blog-love it -the girls are dolls. What a great post. First the opera, how exciting to see Renee Fleming in action. 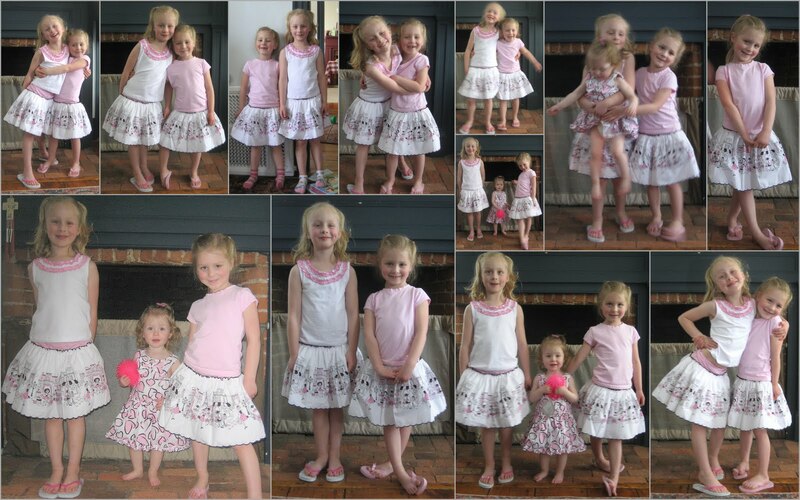 And of course the adorable girls are my favorite, the outfits are so sweet. And yes bloggers are the best, what a special gift. 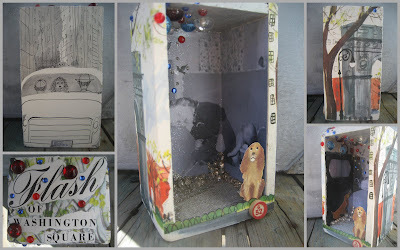 The collage box is so creative and unique. Precious! I love that picture and the collage box is gorgeous! What a sweet and thoughtful gift! Sounds like you all enjoyed the opera. Enjoy your Sunday my friend! Lovely post! The girls look adorable in their outfits, the box collage is fantastic, and I am so glad that you enjoyed the opera so much! Can't wait to hear about your adventures at the flea market!! The opera visit to the met sounds marvelous. I love opera! We have the possibility her, in my little west coast town in Sweden, to go to the met too. That means we are lokking and listening at the movies which send directly from the Met. Great, isn't it??!! Love your little girls. Soooo sweet all of them. Hello Laura! Happy you have a so wonderful time at the opera!! !It seems to have been a wonderful evening!!! Beautiful little models...I love them! And what a nice surprise from your friend!!! I've an invitation for you on my blog...take a look and you can play if you feel like...but absolutely feel free about your decision!!! Happy new week and a special "ciao" to Rob!